Your guests will surely be taking scores of photos throughout your event and party with their smartphones -- all from different points of view, all with different sensibilities, all at different decisive moments. What if you could unite your team of iphone and android photographers and gather all those pictures together in one place for you and all your friends and family to enjoy and share? Our new Instagram Instapic service does just that! We'll set up your Instapic account by creating a unique hashtag (of your choice) for your event, for example #maryandpetewedding. You'll communicate this designated code to all your guests before or during your event. With the free Instagram app installed in their phones, your guests will take pictures throughout your ceremony and celebration -- and then enter your designated hashtag code in their app. 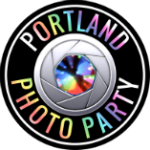 This will send their photos to your dedicated Portland Photo Party online wedding gallery. All their photos will instantly appear in your gallery, visible to your friends and family around the world (a special treat for those who could not attend). And when you and your guests go home, you'll be able to view and share all of the photos taken by everyone! There could be a thousand or more images, all in one gallery, along with photos and videos taken from within our photo booth. Your guests will be able to attach the Instagram gallery photos to an email or share them on Facebook, Google+, Tumblr, Twitter and more than a hundred other social media sites. Photos taken via Instagram will all instantly display on your own Viral Booth online event gallery. To order Instapic as a stand-alone service, please complete this order form. We will send you a Paypal invoice (also payable by credit/debit card) for $99. Our service includes design of a custom logo for your event (see example above). This logo will be displayed on your online gallery. Allow 2 days for setup and activation. You can use letters, numbers and the underscore, but no punctuation or special characters. Capital letters are permitted.